Tom Watson took a stroll on the Old Course the other day. A bitter gale was blowing in off of St. Andrews Bay, and as he squinted into the wind, the cragginess of his face was accentuated; he looked as weather-beaten as any of the stone walls in the auld grey town. Watson had arrived in Scotland 48 hours earlier to do promotional work for Adams Golf, his longtime sponsor, and he had barely slept since. In the Old Course Hotel that morning he looked a bit logy, but as soon as old Tom neared the links, his gait quickened. Next to the 16th fairway is a fence with horizontal wires spaced about a foot apart. Watson, 65, bent over and shimmied through the gap like a boxer entering the ring. "I'm a farm boy. I know my way around a fence," woofed Watson, who was born and raised in Kansas City, Mo., and now makes his home on a ranch outside of town. Striding across the 16th fairway, he stopped to tap his toe on the ancient earth. "This turf!" he said, voice rising. "There's nothing like this turf anywhere in the world. Isn't it something?" It might sound funny for a man to grow misty over a glorified lawn, but for Watson, walking the ground where golf was born is understandably spiritual. When he reached the tee at 17, the Road Hole, Watson fixed a hard gaze on the famous OLD COURSE HOTEL sign. Just like that, he was back in 1984. "You want to drive it over the R," he said, "but I left mine out to the right. I wasn't sure it was even inbounds." He was 34 then and at the tail end of one of the most dominant stretches in golf history. In the preceding 8½ years he had won 35 tournaments, including a U.S. Open, two Masters and the five British Opens that define his legacy. Along the way he dusted Jack Nicklaus so often that the Bear once told Watson, "I'm tired of giving it my best shot and not having it be good enough." By the '84 British, Watson felt an indefinable funk eroding his game. In the final round he was in a dogfight with Seve Ballesteros, then 27. The swashbuckling Spaniard—convention demands the adjective—was as fearless as Watson once had been. They were tied as the action moved to the 71st hole. "It's over here somewhere," Watson said, scouring the Road Hole fairway. The terrain of the Old Course is as alive as the ocean, pitching this way and that, heaving up and crashing down. Watson was doggedly looking for a ripple of turf where his drive had settled 31 years earlier. A sprinkler marked 184 offered a clue. Nearby he found a round, ankle-high bump. "Yes, this is the one," Watson said. The specificity of a golfer's memory always amazes, but it is idiosyncratic—Nicklaus recalls his victories in forensic detail but almost nothing about the losses, while Watson retains the tiniest particulars of his most bitter defeats. "If it had been a flat lie," he continued, "I would have played a more conservative shot to the very front of the green. That's where Jack always aimed. But with this little upslope I knew I could get my 2-iron up in the air, and I could use the wind too. It was into me, which would help the ball land softer. So I took an aggressive line." In these pages Dan Jenkins described the shot as "a semishank, half-flier, out-of-control fade-slice that wanted to go to Edinburgh." Watson's ball flew the green and settled near the stone wall at the edge of the property. He did well to chip to 30 feet. As he studied the par putt, the Old Course shook; ahead at 18, Ballesteros had rolled in a 15-footer for birdie and celebrated with a series of fist pumps, an image that would become iconic. Watson had once been the most feared putter in golf, but he was past the point of being able to will the ball into the hole. He missed, and that one confidence-eviscerating bogey dropped the curtain on the Watson era: He would win only twice in the next 12 years. The vacuum was filled by Ballesteros, who begat a European invasion led by Nick Faldo, who had usurped Greg Norman, who had been the favorite player of a kid growing up in Cypress, Calif. Tiger Woods reached the PGA Tour in 1996, the same year Watson, with a rebuilt swing, won Nicklaus's Memorial Tournament. His career reaches its denouement this week when he plays in his 38th and final British Open, at the Old Course. "It's starting to hit me," Watson says. "I'm a little melancholy. It's like the death of a loved one: There's sadness, of course, but you're left with so many wonderful memories. It's those memories that sustain you." It’s hard to believe now, but Watson was once considered too soft to close out tournaments. There was a jauntiness about him during his early years on the PGA Tour, accentuated by the freckles and the red hair. Herbert Warren Wind captured Watson perfectly in 1981 when he wrote, "It is easy to picture him sucking on a stem of grass as he heads for the fishing hole with a pole over his shoulder." By 1975, Watson's fifth season, he had only one victory and was probably best known for losing the '74 U.S. Open, when he had the 54-hole lead but bled out with a 79 on Sunday in the so-called Massacre at Winged Foot. Two months before the British Open he played in the Byron Nelson Classic, during which he forged a lasting friendship with the host, another farm boy who had gone on to big things. Nelson imparted simple swing thoughts and homespun advice on golf's inner battle; duly inspired, Watson went out and won the tournament. He carried the momentum into his first British Open, at Carnoustie, the most demanding of the courses in the rota. On his first day in Scotland, Watson drove to Carnoustie with Hubert Green and John Mahaffey for a practice round, but they were turned away, told that the course was closed for maintenance. (Can you imagine?) They wound up on the humble locals' links in the town where they were staying, Montifieth. On the opening hole there—Watson's first swing in Scotland—he ripped a drive down the center of the fairway but couldn't find his ball. He searched and searched before dropping another and playing on. As he walked toward the green, Watson was dismayed to discover his drive had been sucked into a tiny, unseen pot bunker on the edge of the fairway, some 60 yards from where he had been looking. "I remember thinking very clearly, If this is links golf, I don't like it," he says. Watson had grown up at the Kansas City Country Club, a stuffy, conservative enclave. He learned the game from his father, Ray, a stern, exacting figure and a strong player. Little wonder that Watson "had a specific, even Catholic idea of how golf should be played," Joe Posnanski wrote in his recent biography, The Secret of Golf. "Good shots were to be rewarded. Bad shots were to be punished." The vagaries of the linksland challenged Watson's worldview, but he couldn't help but be stimulated by it all. "I didn't care for Carnoustie, but I set about learning how to play it," Watson says. The weather was calm during the first three rounds, and after scores of 71-67-69, Watson was in fourth, three shots off the lead. He was the beneficiary of two fortuitous events before he teed off on Sunday. At his rental home there was a knock at the door, and a young girl presented him with a sprig of white heather wrapped in foil, saying it was for good luck. There is a mythic quality to the story, which makes sense since it's informed by a Celtic folk tale: The warrior Oscar is wounded in battle, and in his final, dying moment he picks a sprig of purple heather and asks it to be taken to his love, Malvina; her tears turn the heather white, and she offers the prayer, "May the white heather, symbol of my sorrow, bring good fortune to all who find it." Watson isn't a sentimental guy, but beginning that day he carried the heather in his golf bag for more than a year. Then, just before he teed off on Sunday, he crossed paths with his mentor Nelson. In the past when he was around the lead, Watson had played aggressively to the point of recklessness. Nelson advised him that because of the howling wind, any score around par would give him a chance at winning. Watson replayed those words in his mind throughout the round and competed with the patience and resolve that would become his hallmarks. He was even par for the day playing the 72nd hole, where a big drive and clutch 9-iron set up a birdie that ultimately got him into an 18-hole playoff against Jack Newton. The next day the two were all square playing the par-5 14th hole when Newton pitched it stone dead for a birdie. All Watson did was hole his ensuing chip for an eagle and then play flawlessly coming home. After the victory, Jenkins wrote, "Another authentic American hero was born," but Watson felt differently. "I still hadn't really learned to win," he says. "But that was an important part of the building process of steeling myself and being able to win under the most intense pressure." Watson likes to talk a lot about the process. He is analytical by nature. During a walk through the cemetery in St. Andrews, he engaged a slightly dazed stonemason in a long discussion about his craft. If a professional photographer is using Nikon instead of Canon, Watson wants to know why. Debating politics is blood sport for him. At the highest level, golf is largely metaphysical; trying to grasp the unknowable is what has kept Watson inspired and engaged for all of these decades. With his breakthrough at Carnoustie the search had just begun, for he still had a flaw in his swing that could lead to a violent hook. Late in the next year, at an otherwise meaningless pro-am in Japan, Watson had a hanging lie on a steep slope, so he concentrated on keeping the clubface square to the ball a bit longer on the backswing. The purity of the strike was a revelation that led him to transform his action. At the outset of the '77 season, he won back-to-back at Pebble Beach and San Diego, setting tournament scoring records at both stops. But the process remains never-ending. In the run-up to the Masters, he hooked a ball into the water on the 72nd hole to lose the Players, and a week later at Hilton Head he coughed up a four-stroke lead on Sunday. Whether Watson's new swing—and his psyche—could hold up was the big question as he took a share of the lead into the final round at Augusta, with Nicklaus lurking. Big Jack threw seven birdies at Watson and moved into a tie for the lead, but the young challenger never flinched. On 17, Watson holed a nasty 18-footer for a birdie to go back ahead. Nicklaus was in the 18th fairway when the roar washed over him like a tidal wave, forcing him to back off his shot. As he told Posnanski, "That's the only tournament in my life when I got flustered and couldn't regroup." He dumped his approach in the greenside bunker and made bogey. Watson had felled the champ. This was the backdrop for the Duel in the Sun three months later at Turnberry, the best and most mythologized golf ever played. Watson and Nicklaus both opened with scores of 68-70-65, leaving the field behind. In the final round Nicklaus made two quick birdies to lead by three strokes after four holes. His advantage was still two with six holes to play. Watson, drawing on his Midwestern stoicism, was undeterred. "Nothing ever fazed him," says Scott Simpson, who outdueled Watson to win the 1987 U.S. Open. "He was a fighter. He hits the shot, he marches on, and then hits the next one. He had a great attitude, especially for the major championships." Indeed, Watson holed a tricky 13-footer at the 13th hole to pull within one, and at 15 he buried a 60-footer to pull even. 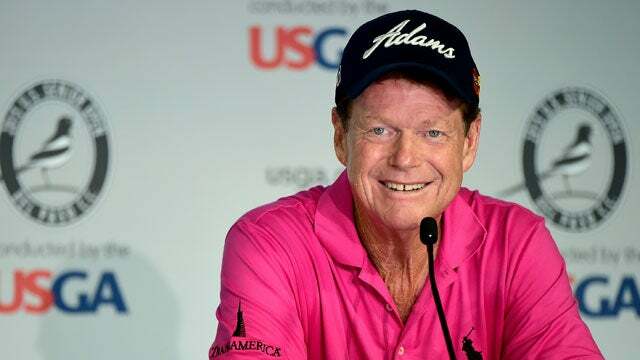 The pressure was suffocating, so imagine Nicklaus's surprise when he saw Watson standing on the 16th tee with an impish grin. "This is what it's all about, isn't it?" Watson said. "You bet it is," came the reply. They were still tied playing the par-5 17th when Watson hit what he calls "one of the best 3-irons of my life," leaving 20 feet for eagle. Straining to match him, Nicklaus missed the green with a 4-iron and couldn't get up and down. Watson's tap-in birdie gave him the lead, and after a perfect drive on the 72nd hole he had 180 yards left, the distance he usually hit his 5-iron. His caddie, a barroom brawler named Alfie Fyles, handed his man a 7-iron, saying only, "The way your adrenaline's pumpin', Mister." Watson followed with an utterly ruthless shot, to 2½ feet. Nicklaus, as the script demanded, rolled in a 50-footer for birdie, making Watson's gimme a little less so. He rapped in the putt and once again had taken down Big Jack, 65 to 66. Watson had worked as hard at the game as anyone since Ben Hogan, propelled by a fear of failure born from a father who was impossible to please. It was at Turnberry that Watson at long last felt like a champion. All these years later he says, "That was the most significant victory of my career because that was when I finally believed I could play with the big boys. I played against the best, with the best, and I beat the best." Watson’s third claret jug came in 1980, on perhaps the most venerated course in the rota, when he had rounds of 68-70-64-69 for a then Open-record total of 271. It was the best performance of what he calls his best season, but for him the unquestioned highlight came when hardly anybody was watching, on Tuesday afternoon. "I had just finished my practice round," Watson says. "A bunch of us [players] were staying at Greywalls"—a lovely hotel that sits just behind Muirfield's 10th tee—"and in the library there we'd often gather for a beer. In walks Arnold Palmer and Jerry Pate and Andy Bean and I forget who else. They had just finished their practice round, and Jerry was pretty chatty. He had beaten Arnold out of $300. He was all over Arnold. All Arnold says is, 'Give me a beer.' Jerry is still ragging on Arnold, and you could see the steam coming out of his ears, and finally Arnold says, 'C'mon, Tommy, let's go play these so-and-so's.' So we went and played an emergency nine. "We started on number 10, and Arnie and I drove it in the rough. I had to lay up short of the cross bunkers, and he, well, he wound up in his pocket. I'll never forget it: Jerry hit a beautiful drive right down the middle and this beautiful second shot with a 5-iron right at the hole, and he yells, 'Get in!' He's posing and preening, and it almost did go in. I hit my chip about 25 feet past the hole and then stepped up and made the putt, and whaddya know, Jerry misses his little one. "By the time we get to the 16th tee his partner, Andy Bean, says, 'I'm not pressing these guys anymore.' We got Arnie's money back and then some because I made every putt. And I kept making them all the way through till Sunday. But to play 27 holes on Tuesday of the Open Championship week? That's a love for the game." It’s a curious sidenote that Watson won his first three Opens without feeling any romance for the linksland; the tempestuous winds and unpredictable way the ball rode the turf still offended his sense of justice. In 1981 he began to see the light. Ahead of that year's Open he barnstormed across Scotland and Ireland with Sandy Tatum, who at 95 remains one of the game's grand old men. Tatum was the 1942 NCAA champion at Stanford (Watson's alma mater) and later the president of the USGA, and he has the soul of a poet. "Basically, Sandy helped me understand that accepting a bad bounce, and recovering from it, is one of the game's great challenges," Watson says. "And I've always loved a challenge." Watson arrived at the '82 Open still flying high from his U.S. Open victory a month earlier, at Pebble Beach, where he famously chipped in on the 71st hole. Vanquished again, Nicklaus told him afterward, "You little sonofabitch, you're something else." At Troon, Watson never had his best stuff, but he delighted in grinding out solid rounds on the first three days. "Anyone can shoot a good score when they're playing well," Watson says. "But to post a good score when you're struggling with your game—when you have to fight hard for every par—that's the ultimate satisfaction." He was five strokes off the lead when he made the turn on Sunday, but the leader, 25-year-old Nick Price, was already looking shaky. Troon's 11th is the celebrated Railway Hole, a 481-yard par-5 that was playing into a punishing wind. Now two shots back, Watson smote a 3-iron to three feet for an eagle that tied him for the lead. Watson methodically parred his way to the clubhouse while Price bogeyed three of the last six holes. "I never felt like I was going to win that one," Watson says. "Some tournaments you take, some are handed to you." Did you deserve to win it? "Deserve has nothing to do with it. I shot the lowest score. End of story." If an entire tournament can be distilled into one swing, it happened at the '83 Open. Watson came to the 72nd hole leading by one over Bean and Hale Irwin, who had whiffed on a two-inch putt the day before. Birkdale's final hole is a macho 473-yard par-4 that plays between towering sand hills. Watson split the fairway and had 213 yards to the hole, with a strong wind quartering off the left. He pulled out his 2-iron. "I can still feel that shot in my body," he says. "I can see the ball in the air. I can see it coming down right at the flag, but then the crowd just engulfed the fairway, running under the gallery ropes, so I couldn't see how close it was. The cheer from the crowd told me it was pretty close, but I guess I knew that already. I look back at all my Open Championship victories, that 2-iron is the shot I probably remember the most. Tough club to hit, wind in my face, and everything on the line. It's the shot I'm most proud of." The ball had settled 15 feet from the hole, and two putts later Watson had his fifth Open title. Live by the 2-iron, die by the 2-iron. It was the following year at the Old Course that Watson made a mess of the Road Hole and lost to Ballesteros. The defeat was crushing for a couple of reasons. It was a golden opportunity to tie Harry Vardon's record of six Open victories. There was also a sense of unfinished business with the Old Course. In 1978, Watson had taken the lead into the final round, but he made four straight bogeys on the front nine and was run over by Nicklaus, who won an Open at St. Andrews for the second time. Nicklaus's obsession with winning on the Old Course was imbued in him by Bobby Jones, who took the Open there in 1927. 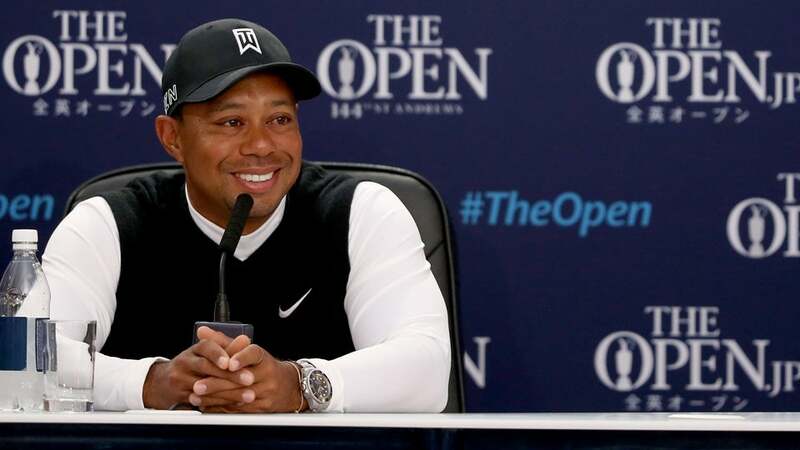 Says Nicklaus of his boyhood hero, "He always said that a golfer's record—a great golfer's record—is never complete unless he wins at St. Andrews. There are a couple of places in the game of golf you want to win. I think [the Old Course] is probably the most special place of all to win a golf tournament." Watson has been listening to this for nearly 40 years now, but he refuses to take the bait: "Sure, winning one in St. Andrews would've been nice. But I won more than my share." Following the loss to Ballesteros, Watson's game declined rapidly, to the point that he says, "I hated golf." It's a startling admission because no one has ever seemed to love the game more. In 1994 he discovered on the driving range at Hilton Head what he calls "the secret": By taking the club back far to the inside and then dropping it to the outside on the downswing, he had a move that repeated without fail. A few months later he returned to Turnberry and says he had the best ball-striking week of his life. But Watson's putting was typically awful, and Price surpassed him on the back nine on Sunday, payback for 12 years earlier. That night Watson was moping in his hotel room when Nicklaus cajoled him into playing on the pitch-and-putt course in the shadow of the Turnberry Hotel. Along with their wives they stayed out there until dark, a treasured memory for them all. As crazy as it sounds, you can't count out Watson for this year's Open. Because the Old Course plays so firm and fast, long hitters will be using irons off many tees, negating the old man's distance disadvantage. Watson's most important tune-up came at last month's U.S. Senior Open, where he damn near shot his age, posting an opening 66 en route to a tie for seventh. 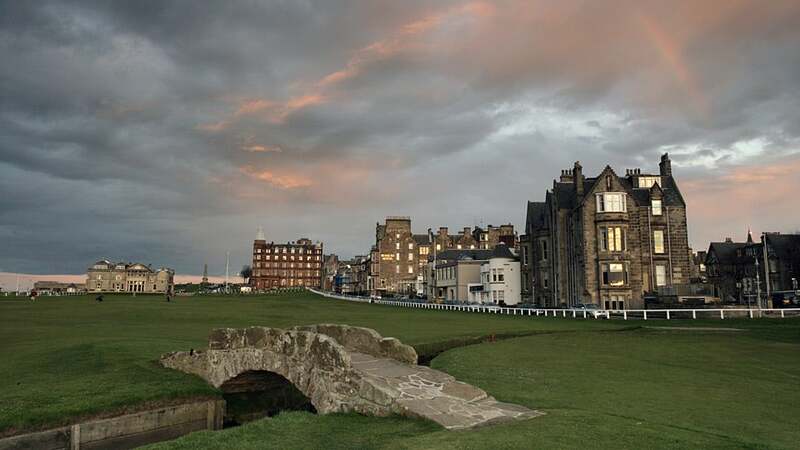 No track in the world rewards local knowledge quite like the Old Course, so Watson will enjoy a home field advantage similar to Turnberry, where he lost in a playoff in 2009 at age 59, one of the more remarkable feats in golf history. Watson had arrived on the 72nd hole needing only a par to win. After a perfect drive he had 164 yards to the front of the green, 189 to the hole. With the wind at his back he was torn between an 8- and a 9-iron. You could practically hear Alfy Files whispering from the grave—The way your adrenaline's pumpin', Mister—but Watson went with the stronger club. His ball landed exactly where he was aiming, on the front edge, but it caught a tiny downslope and took a hard bounce forward. "Maybe the ghost of Harry Vardon was blowing on it," Watson cracks. The ball trickled across the putting surface and over the back. Now Watson faced another choice: chip or putt? The pin was cut tight to the back of the green, just beyond a waist-high swale. Using the wedge would give Watson a better chance to knock it close, but it also brought into play the horrifying possibility of leaving the chip short and having the ball roll back to his feet, costing him the tournament. The young, fearless Watson would surely have chipped it, but now he acceded to his nerves and went with the putter, knocking it eight feet past. The par putt never had a chance; the stroke was a nervous jab. He had nothing left for the ensuing four-hole playoff and went meekly against Stewart Cink. Afterward Watson was again holed up in his room in the Turnberry Hotel, inconsolable. He refused to take any calls until Nicklaus, who had been glued to his television at home in Palm Beach, Fla., got through to Watson's wife, Hilary. Jack gave his old friend a no-nonsense pep talk: With the whole world watching, Watson had hit a perfect drive and basically a perfect approach shot, and even after a bad bounce had the clarity to choose the right club for his third shot. As for the putt, well, Nicklaus joked that Watson had merely struck it like the old fart he was. What meant the most to Watson was Nicklaus's affirmation that he had played the right shot from behind the green. "Jack Nicklaus always made the correct decision on the golf course," Watson says. "His saying I made the right play instantly took away a lot of the anguish." "Tom is very traditional," Nicklaus continues. "He has a great respect and appreciation for the history of the game. Those things mean a lot to him. It will be very emotional for him to end his career at St. Andrews." It's no surprise that Watson frowns at such talk. "I'm not going there to have fun," he says. "I'm going there to compete." Same as it ever was.